I’m not really a fan of the adjective ‘cosy’ (actually, being an Americanism, technically it’s ‘cozy’) when applied to classic detective fiction, but I appreciate that it serves a purpose. It paints a picture of a land far from sadistic serial killers and pulse-pounding races against time, a land inhabited by little old ladies and bloodless death where everything is resolved, or at least halted, for scones and cream at 3pm, where the unpleasant never prosper and where thuggery and what little violence is allowed are perpetrated at the severe risk of extradition. A great many classic crime authors couldn’t actually be any further from ‘cosy’ if they tried, hence my opposition to the term, but right now that’s beside the point. 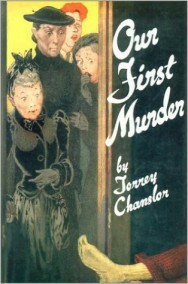 Our First Murder, the debut and 50% of the fictional output of Torrey Chanslor (another pseudonym, making it three reviews in a row now), is, however, about as close to a ‘cosy’ mystery as I’ve ever read. Indeed, the two flashes of rather disconcerting violence are tossed is so casually, so disaffectedly, that it feels like a conscious attempt to not appear too soft, too comfortable, and to heighten the peril at the core of a book overseen by three women the youngest of who is in her middle-50s. This is a conflict throughout – the mystery must be solved by these heroines, but too much complexity or too many escapades will be beyond them, limiting the scope of both – and, while a very charming read at times, it is much weaker for this immediate restriction placed upon it. The elderly Beagle Sisters – sensible, sharp-minded Amanda and fluffy, twinkling Lutie – inherit a Noo Yawk PI business from their brother and move, along with younger cousin and narrator Martha Meecham, from the Boondocks to the Big Apple. They are almost immediately called in by an existing client to help with a murder and, of course, their charming small town ways and good common sense will prove superior to the efforts of Inspector Moore and his squad. In this regard, and many others you can predict, it plays out exactly as you’d expect. The boarding house where the murder occurred is full of Various Types who must all be cleared (and, to be fair, Chanslor does a very good job with the distinct personalities of the denizens, though only really strikes an original note with the aging and bitter Dotty De Vere), information is withheld from the police and passed on to the more personable elderly spinsters, great wisdom is contained in Lutie’s seemingly empty-headed prattling, and it’s all very delightfully done. …but such embers fail to catch light with any consistency, instead relying on the incongruence of the situations to supply implied humour (Lutie in a cab, Lutie backstage at the theatre, Lutie in a fashionable nightclub) rather than actually working at being funny. She is a fabulous character, poorly served by the rather pedestrian murder plot around her, and in spite of my misgivings about this book I’m tempted to buy the next one (care to guess its title?) just to spend more time with her. My main problem with the plot is that there’s very little actually going on. Kelley Roos was (were?) excellent at talking you through one interesting scene only for it to be revealed that something even more interesting was actually happening. Here, someone appears to be withholding information and they are, someone appears to be lying and they are, someone appears to want to tell something significant and they do…it’s just not very interesting. The explanation at the end, too, is simply restating facts already established in the narrative without any really new spin put on them (and the one thing added has been deliberately withheld, I can’t help but feel, so you couldn’t get there first). As a period piece charting a key phase of the genre it’s very interesting, but if you’re looking for something more than quaint charm and squandered potential you may wish to look elsewhere. Lutie is an absolute dear, however, and for her alone, if you have the time and money to spare, this is just about worth both. Yeah I was the same when I read the book, feeling it wasn’t as good as other similar type novels but still kind of drawn in by the amateur sleuths. I planned to get the second one, but kind of forgot, so this review has been a helpful reminder. And yes I hate the word Cosy/Cozy too!